The production of various kinds of power tools manufacturer. It is currently a small area of metal and nonmetal materials rust deburring, surface polish, such as efficient polishing tools. jewelry,gemstones,glass,watches,crystal,car,motorcycle,bike,feed ramps or trigger jobs etc. Best effect used with electric drills, grinders or Dremel rotary tools. Make your polished goods more cleaner and brighter. Length:40mm/1.57''(Approx)With small, good polishing effect, high efficiency, low cost. Before you use the Wire Brushes Sets,please make sure you wear a good pair of safety glasses and other Protective equipment! This Wire Brushes Set could not be reuse! With small, good polishing effect, high efficiency, low cost. Ideal for general polishing of most ferrous metals, stones, glass and ceramics. Can be used with 421 polishing compound to produce a smooth finish. A felt accessory continually renews its own surface while being used. TURN YOUR Dremel or other power rotary tool into high-speed buffing machine. Ideal for polishing and buffing on plastics, metals, jewelry and other small parts. Used primarily with polishing bits and accessories. 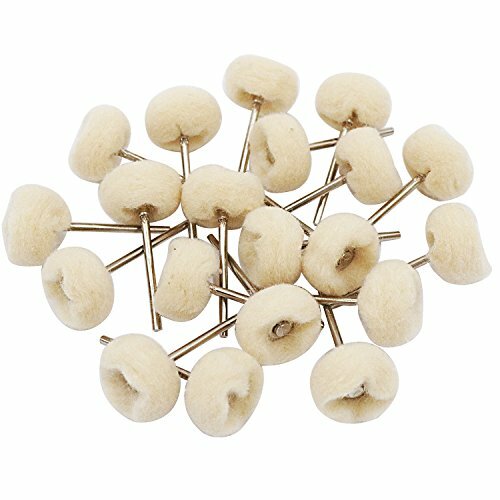 HIGH QUALITY compressed-wool felt wheels for cleaning, polishing & buffing metal, wood, plastic & more. They can be used with or without polishing compound such as 421 polishing compound to produce a smooth finish. 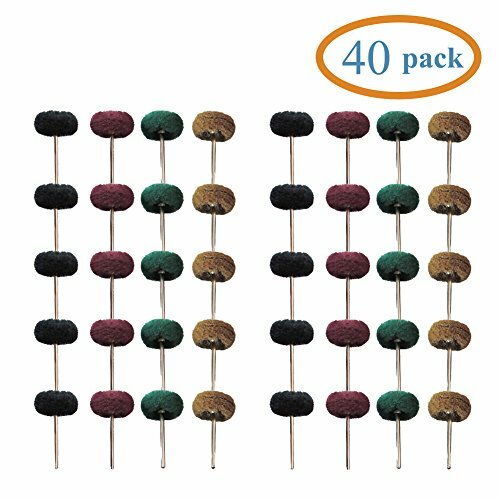 FUNCTION:Smooth and refine surfaces by using these felt buffs to polish or grind metal, ceramics and glass.Great for contractors,Perfect for cleaning and polishing,Ideal for polishing and buffing on plastics, metals, jewelry and other small parts. 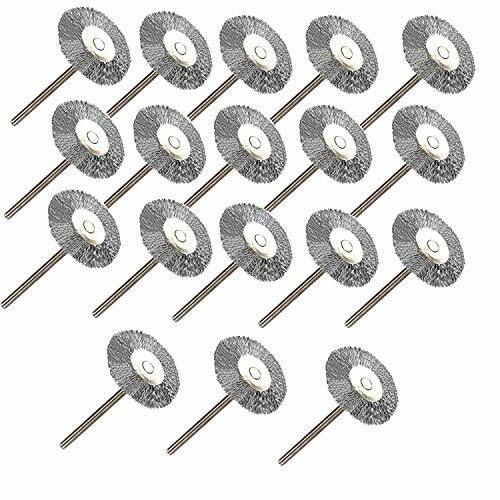 These are diameter 6 inch soft buffing and polishing wheels which are ideal for stainless steel, chrome and other metals. Excellent buffing and polishing for wood metal stone brass, aluminum, bronze. The 1/2" arbor hole fits most of the bench grinder bench Buffers or bench polisher . [Easy to install]:The polishing wheels are 1/2" center hole fits most bench grinder. [Professional design]: The polishing wheels much thicker to last longer and provide larger surface area,Thick concentrically sewn circles design holds plys together more stiffly so greater pressure can be applied. [Make your work easy]:The extra thick buffing polishing wheels are 70 ply, Extra plys can improve work efficiency. DIAMETER:6 inch Face,1/2 Arbor Hole, H: 1 (70 ply) Material: Cutton.Attention:Due to its fine cotton buffing wheel, it would have a little flying fibre during first time working. Do not run in excess of 10,000 RPM. Worked well and lasted much longer at the lower speed. 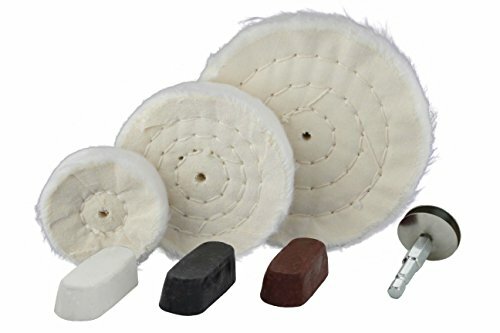 Drixet 7 Piece Buffing Kit Set Includes: 3 Assorted Shaped Cotton Felt Pads, 3 Polishing/Cutting Compounds & 1 Mandrel. When finishing sanding/cutting you're left with lots of scratches and bumpy/rough surfaces, or with usual wear and tear/dirt on your furniture, appliances, jewelry, car etc. The Drixet 7 Piece Buffing Kit that you place on your drill can be applied onto anything easily with no pressure to buff and polish with phenomenal results. 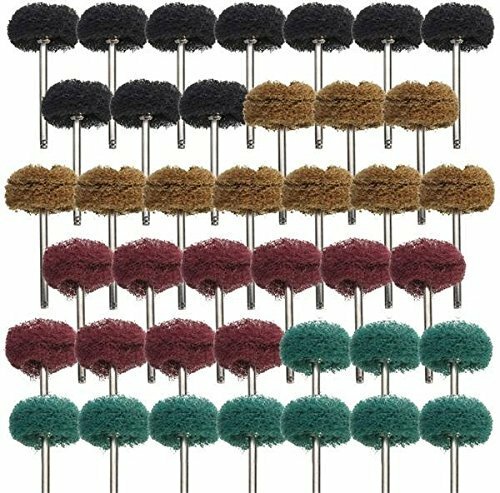 With the 100% Cotton Felt Wheels you'll get a mirror finish, and the roundness will help you get into all corners. When having burr/bumpy surfaces and still need a light sand but a sander will ruin it, just use this black compound that will make it smooth. Your surface is smooth but what you need is more smoother, just use this brown compound that will give you a mirror finish. Sometimes is needed a much glossier finish or gentleness on delicate martials like silver gold etc. just use the white compound that will provide the extra shine. The Sturdy Shaft with the 6-Point End will fit on most rotary tools and is adjustable with 2 washers and a Philip screw to make it fit most polishing/buffing discs. To clean the wheels just take a flat screw driver and run it through while spinning!. Get Your Glossiness Back Like Brand New! The Drixet 7 Piece Buffing Kit will help you get a smooth and burr-free mirror finish on a wide variety of surfaces helping you handle all kinds of projects. 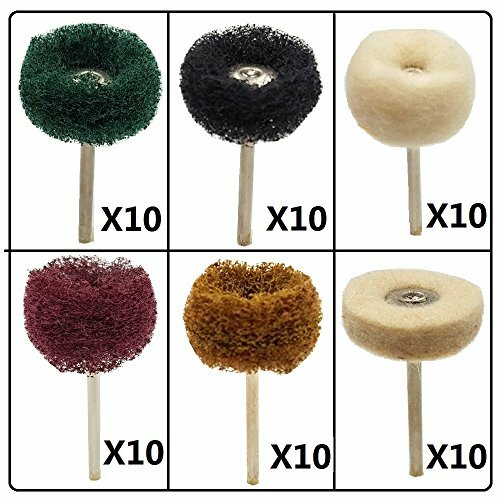 SPECS: Cotton Felt Pads Height: 3/4 - Several Diameter Sizes: 2 (50mm), 3 (75mm), 4 (100mm) - 1/4 Adjustable Shank with hex end - Shank Length: 2-1/2 - 3 Compounds (Black/Brown/White): Length: 2-1/4 - Width: 7/8 - Height: 5/8. 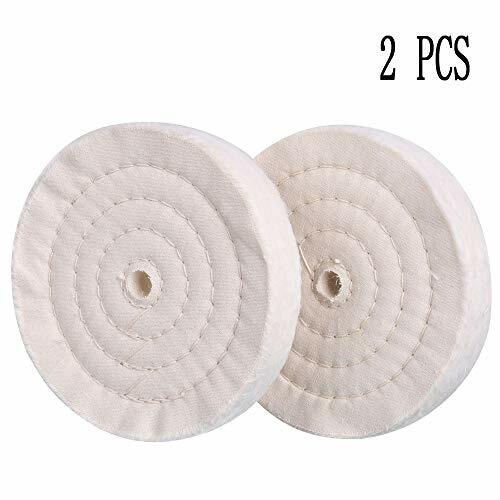 QUALITY: This 100% Cotton Felt Pads is built for long wear and consistency when smoothing - The High Quality Metal provides sturdiness and strength - Fits Power Drills, Die Grinders, Air Grinders, Angle Grinder, Drill Press, and most of all other rotary power tools. DESIGN: The Round Felt Pads will get into any corner and hard to reach places - The Adjustable Shaft with Hex End will fit a lot of felt disc types and will attach to all rotary tools. USES: Used for Polishing, Cutting, Waxing, Cleaning, Repairing, Restoring, Reviving etc. on any material like: Aluminum, Stainless, Steel, Brass, Cast-iron, Auto Body work & Jewelry. Do not run in excess of 15,000 RPM, worked well and lasted much longer at the lower speed. If you work with high speed (over 15000 RPM) Tools, we suggest you wear goggles to finish the work. Abrasive wheels can be applied to a range of metals, including aluminum, brass, copper, stainless steel as well as other hard-to-grind materials such as ceramic, glass and plastic. Applied wet or dry, buff wheels enable you to achieve a smooth, uniform finish and conformability to irregular surfaces with minimal smearing. Compatible with both EZ402 EZ Lock mandrel and standard 402 mandrel. Constructed of non-woven nylon fibers infused with aluminum oxide grit. Leaves a fine satin finish on metals. Used for polishing all types of metal and jewelry. Easily remove tarnish from brass. Widely applied in the micro electronic devices and other industries. Great for car detailing and restoring door & window hardware. It can improve quality of metal stone material, and it is an important part of the machining process. Light sanding and tarnish removal, fit for your polishing need. It is an efficient polishing tool of metal and non-metallic materials in small area of rust deburring and surface polishing. Suitable for metal surface cleaning, derusting, grinding, dusting, deburring, polishing, stripping residue. Quantity: 40 pieces, each grit 10pcs. For use with Dremel, Chicago, Craftsman and other Rotary Tools that utilize an 1/8-Inch shank size. SIZE - Shanks are 1/8 inch (3mm), buffing wheels are 1" in diameter, 25mm Mix Grit Abrasive Buffing Polishing Wheels. 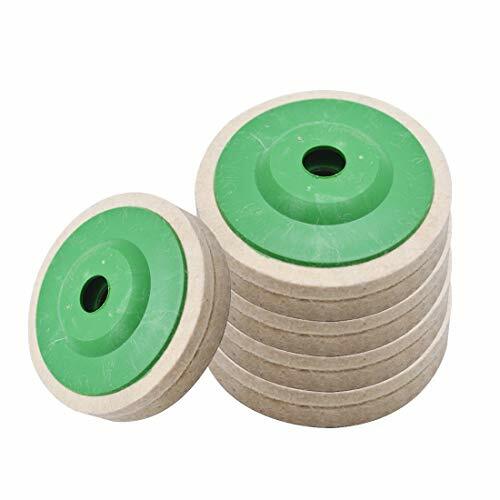 ABRASIVE BUFFING WHEEL SET - 25 mm abrasive wheel with 3 mm silver shank and 4 different grits, Brown 120Grit, Green 180Grit, Red 320Grit, Black 400Grit each grit 10pieces, total 40pieces. Suitable for most ferrous and non-ferrous metals, castings, welded joints, rivets, rust, stone, glass. REPAIR THE DENTS - Buff wheels enable you to achieve a smooth, uniform finish and conformability to irregular surfaces with minimal smearing. Great for all types of detail work in both hard and delicate materials. CONVENIENT AND PRACTICAL - Small buffing wheel is an efficient polishing tool of metal and non-metallic materials in small area of rust deburring and surface polishing, high efficiency, low cost. 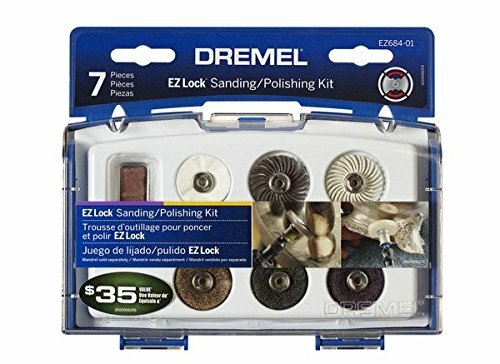 Dremel Model EZ684-01- This sanding and polishing kit is designed to help polish a variety of materials to a high luster, clean those hard to reach areas, remove rust and a whole lot more. 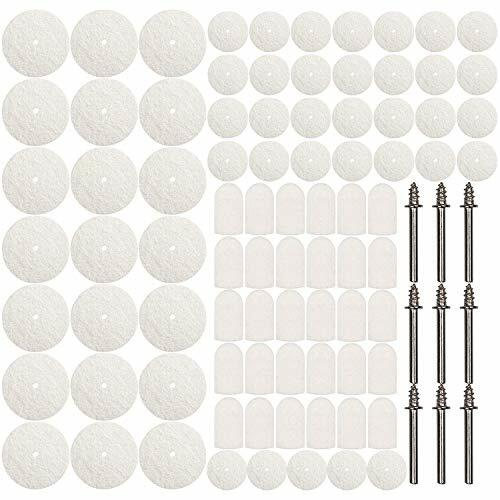 This kit includes seven assorted sanding and polishing Dremel Accessories: 423E, 421, EZ471SA, EZ472SA, 511E and 512E. All accessories are 1-Inch in diameter. Fully compatible with existing Dremel mandrels EZ402 and 402. EZ471SA and EZ472SA are great for getting into tight contoured spaces. The 512E is great for removing light paint from wood, and the 423E is perfect for removing tarnish from brass. 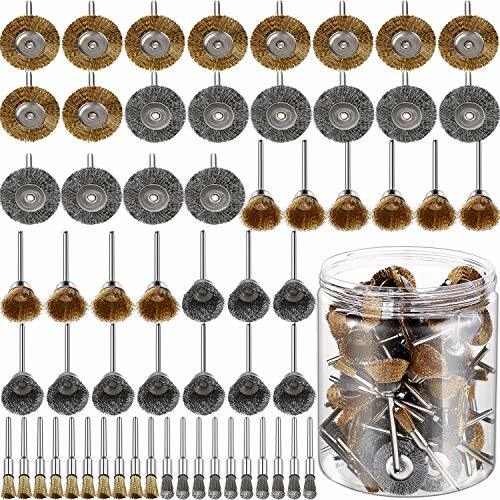 Kit Contents (7 pieces total): (2) EZ lock detail abrasive brushes, (3) EZ lock abrasive buffs, (1) EZ lock polishing cloth, (1) polishing compound, (1) storage mini kit. Application: Works great for polishing,grinding. Carving and many more, make polished goods clean and bright, best used for various mould, glass, medical equipment, metal, etc. Great for all types of detail work in both hard and delicate materials. Great for cleaning, deburring and general surface-finishing many items made from steel, aluminum, silver, pewter or other metals. Superb to use on corrosive resistant metals like pewter, aluminum and stainless steel to prevent "after rust". Application: suitable for metal surface polishing, rust etc. 1. When using it, it is recommended the rotating speed not too fast. 2. Before you using the brush, it is recommended to add a little water on the place that what you want to polish. Does not rust, durable, long service life. Coating, can improve the quality of metal stone,economy, high efficiency. Removal wheel constructed from molded rubber with a stop use line and a 24 thread (5/16") arbor. For safe and quick removal of sun baked vehicle striping and decals from glass and painted surfaces. Vast Applications. Engineered to remove unwanted decals and stripes without damaging the substrate. Outstanding Performance. Developed to dramatically reduce time spent on the removal of decals and stripes. Easy to Use. Attach the included drill adapter to your rubber wheel and a household drill to quickly remove sun baked vinyl stickers and car wrappings in seconds. PROVEN SUCCESS - The Decal Eraser Wheel made from soft rubber is the most successful sticker removal tool in removing decals from Cars, Windows, Signs, Metal Haul Boats & Trucks. SAFE: Better for the environment, toxic chemicals and skin irritating adhesives are not required. Designed for easy access into narrow holes and confined areas, great for removing burrs, rust, dust, removing the oxide layer, also suitable for the use of electric tools such as angle grinder, electric drill, special equipment and so on. Comes with 20 pieces of T-shape steel wire wheels, 20 pieces of pen-shape steel wire wheel, 20 pieces of bowl-shape steel wire wheel. Before you use the wire brushes set, please make sure you wear a good pair of safety glasses and other protective equipment. 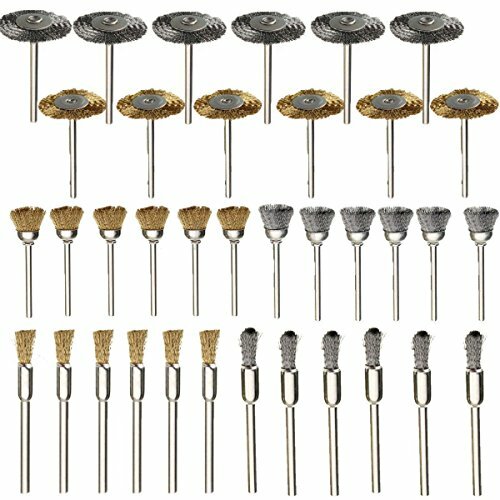 Practical tools: these wire brushes can remove burrs, rust, dust, removing the oxide layer, scale and paint in hard to reach areas, etc. 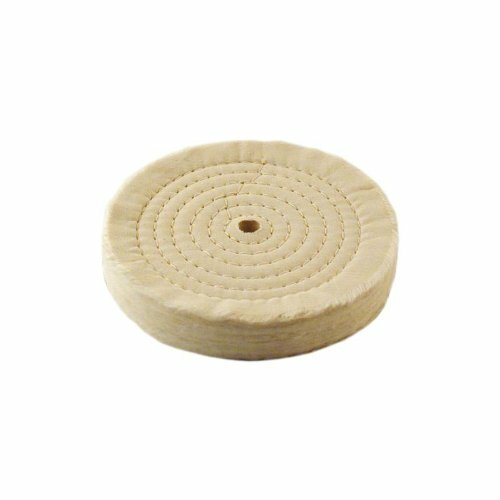 Use for grinding and polishing flat or contoured surfaces,Wheel can remove paint and sand, grind, level, and strip surfaces and makes quick work of it. Suitable for deep hole polishing and finishing on the surface of metal and non-metallic complex surface. Supporting used with straight grinder, hand drill, pneumatic tool, electric drill, pneumatic drill, bench drill, etc. Great for removing rust . Outer Diameter: 30mm,Flap Wheel Thickness: 10mm ,Shaft Diameter 3mm/1/8"
Outer Diameter: 20mm ,Flap Wheel Thickness:25mm,Shaft Diameter 3mm/1/8"
Sharp grinding, strong grinding power, solid and durability, long life, high tensile strength cloth, high efficiency. We recommend working with safety glasses and other protective equipment. 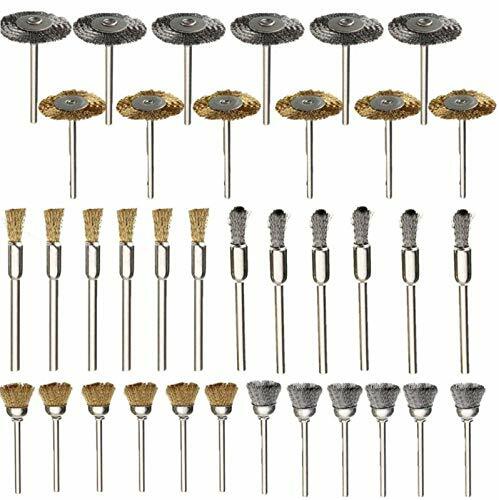 Sturdy material:Made of stainless steel, durable for a long service life, steel wire brush set can use for many different types of wood, metal materials,polishing,castings,structural steel,sheet metal and grinding all kinds of rough surface. Designed for easy access into narrow holes and confined areas. crimped style for light to medium duty applications, removes rust, scale and paint in hard to reach areas.hardened wire cleaning brush for reducing wire breakage. 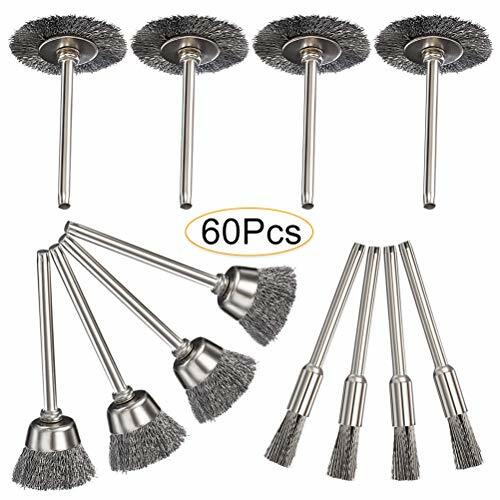 Applications: These brushes can remove brass, copper, gold burrs, rust, dust, removing the oxide layer, scale and paint in hard to reach areas,so great for cleaning your car, garage, office kitchen and ect. 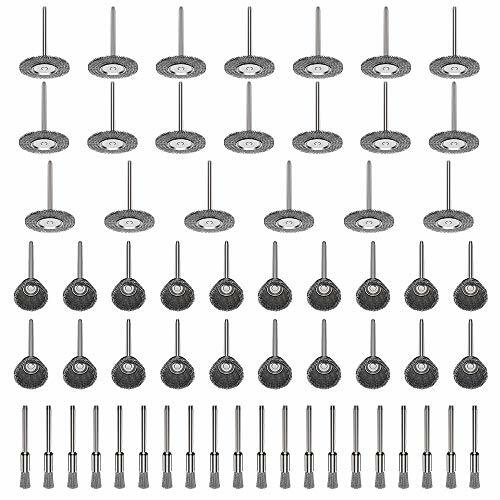 Use for many types of drill: Great use for Dremel and Foredom tool, angle grinder, electric drill, door knobs, automobile parts and die grinders ect. 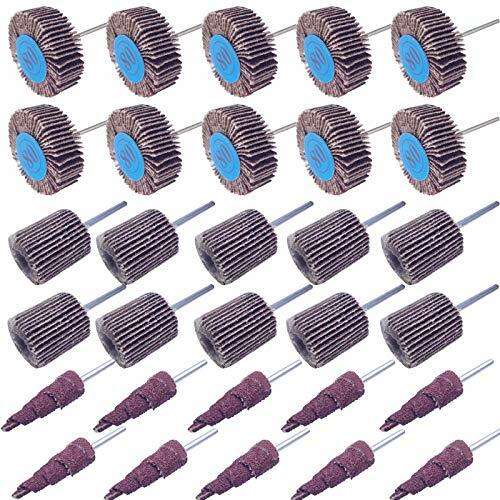 Package Included: 20 Pcs bowl-shape wire brush set, 20 Pcs pen-shape wire brush set, 20 Pcs T-shape wire brush set. 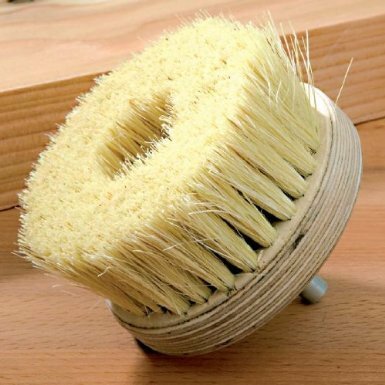 Also comes with a durable plastic case for easy storage of these mini Wire Brush Wheels. 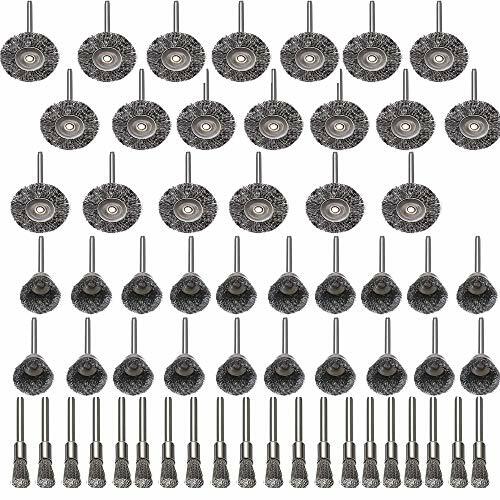 Keadic 100Pcs Rotary Tool Buffing Wheels Set for Dremel Application - 1/8 Inch Shank Specification:  Materal: shank wool, sesame, rubber, jade, cowhide  Size: 40-47mm in length; 4mm/ 5mm/ 6mm/ 8mm/10mm in the diameter of head; the shank is 3mm in diameter. 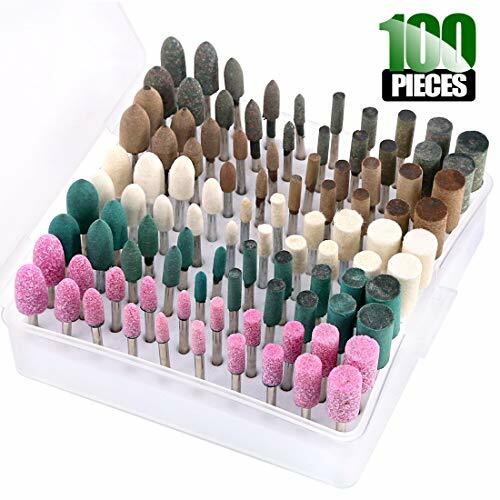  Quantity: 100Pcs (50 cylinder shaped grinding heads and 50 bullet shaped) Package includes: shank wool 20Pcs sesame 20Pcs rubber 20Pcs jade 20Pcs cowhide heads 20Pcs Applicatioin: The Pink Jade Head - sanding chamfering, suitable for rough grinding; The Sesame Grinding Bit - be made of special rubber and abrasive blending, especially ideal for rough grinding of metal such as aluminum and copper; The Cowhide Heads - have good elasticity and wear resistance, perfect for agate, jade, mold, copper and aluminum polishing; The Rubber Grinding Heads - quickly polish hardware accessories, jade and other materials; is equivalent to the grinding effect of 2000 mesh sandpaper The Wools Heads - could be widely used in mirror polishing such as pneumatic, electric rotary grinder, various molds, glass, medical equipment, gold and silver jewelry, metal, non-metal surface polishing and more; need to be used together with the abrasive paste.  1. 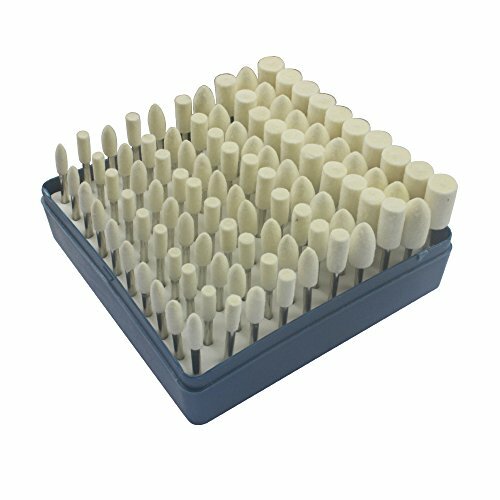 Type of Product Our polishing kit contains 100pcs shank wool, sesame, rubber, jade and cowhide heads, totally including 50 cylinder shaped grinding heads and 50 bullet shaped, fine and durable.  2. 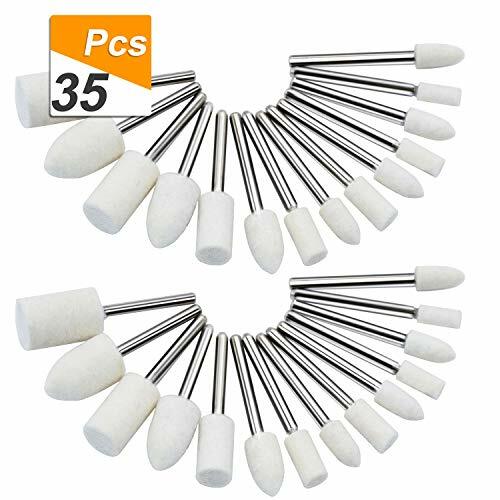 Complete General Sizes The length range of these polishing bits are 40-47mm, the diameter of head respectively are 4mm/ 5mm/ 6mm/ 8mm/ 10mm and the shank is 3mm in diameter. They would make ideal effect with electric drills, hanging mills, grinders or dremel rotary tools.  3. 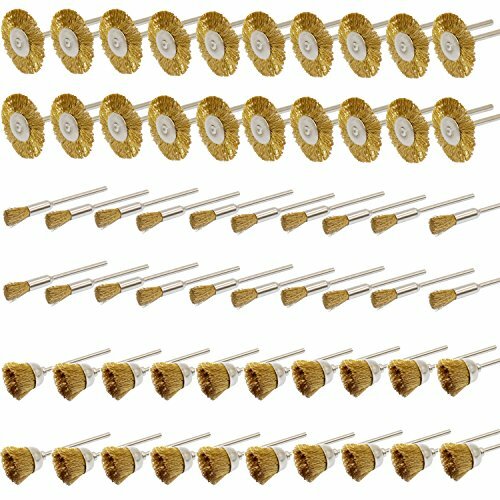 Wide Application These dremel polishing wheels could be used for carving, grinding and polishing to make the polishing products cleaner and brighter, perfect for metal, jade, various molds, glass, medical equipment, gold and silver jewelry, non-metallic surfaces, etc.  4. Products instructions The Pink Sanding Head is used for sanding chamfering; the Sesame Grinding Bits are ideal for rough grinding of metal such as aluminum and copper; the Cowhide Heads have good elasticity and wear resistance, perfect for agate, jade, mold, copper and aluminum polishing; the Rubber Grinding Heads can quickly polish hardware accessories, jade and more; the Wools could be widely used in pneumatic, electric rotary grinder, various molds, etc.  5. Reliable After-sale Service We are greatly confident with our products. You will not regret if you got it. If you have any problem with them, please feel free to contact us, we will reply you within 12 hours. If you are not really satisfied with them, you could return or change them with no charge within 90 days. Therefore, please purchase it with no worry. Wish you a good shopping time! 1.Before you use the Wire Brushes Sets,please make sure you wear a good pair of safety glasses and other Protective equipment! 2.This Wire Brushes Set could not be reuse! 3. When using it, it is recommended the rotating speed not too fast. 4. Before you using the brush, it is recommended to add a little water on the place that what you want to polish. 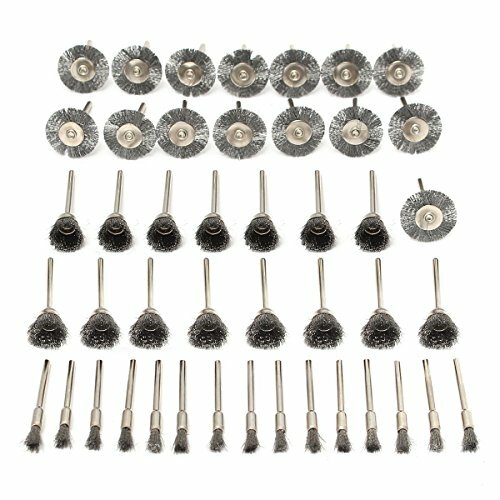 High quality material: wire brushes set is made of stainless steel, durable, long service life on the toughest cleaning jobs. Please note that before you use the Wire Brushes Sets,please make sure you wear a good pair of safety glasses and other Protective equipment! 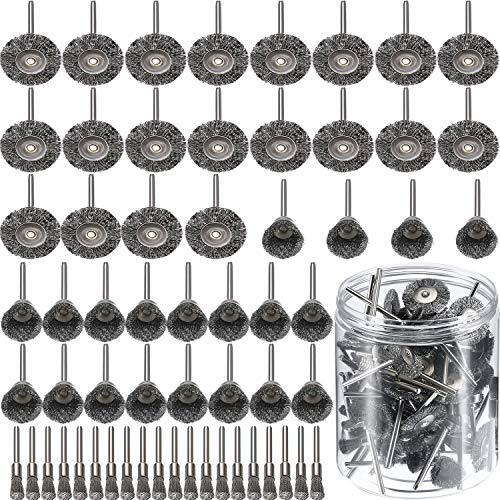 What you get: 60 pieces steel wire brush wheel, include 20 pieces of T-shape wire wheel brushes, 20 pieces of pen-shape wire wheel brushes, 20 pieces of bowl-shape wire wheel brushes.